What are my thoughts on this one? I can't believe it took so long for me to pick this one up. I just love it! It is absolutely gorgeous! And that is saying something because I am not a big fan of reds. 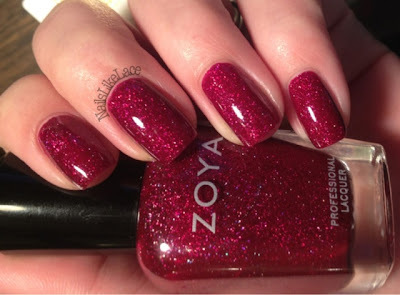 I don't usually love reds, nor do I typically swoon over a purple, but Blaze and Aurora are, oddly, two of my favorites from Zoya! Just stunning, both of them!